Do you love indulging in a crispy treat every now and then? Often this marshmallow based treat can be sticky and messy. However, Ethos Crispy treats has come out with a variety of flavors that allow you to enjoy this treat without the hassle or the mess of a traditional rice crispy treat. This is just one of those simple brands that you just can’t go wrong with for these flavors. If you are unsure of what flavor would be the best to start with, let us be the first to recommend their Original flavor. 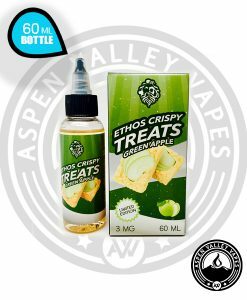 Ethos Crispy Treats Original flavor allows you to maintain the indulging sensations while also removing the messy, and sticky situations that come with the treat. The best part is, it tastes like the real deal. If thats to bland, or not your style our next suggestion would be to try out the Strawberry flavor as it adds a different aspect to the treat. However, it also makes it that much more indulging. What better than to add a simple yet satisfying strawberry flavor to indulge in while your at it. 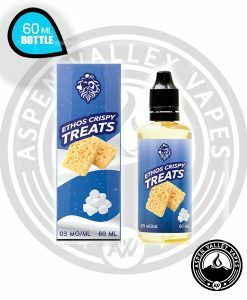 Now available on Aspen Valley Vapes, this representation of a rice crispy treat allows the user to indulge in a satisfying treat, without the sticky fingers. Flavors: Original, Strawberry, and Blueberry.